In many pneumatic conveying systems, a rotary valve or rotary airlock is used to feed the dry bulk material from one system to another. The other function of a rotary airlock is to help prevent the transfer of air from the system below the valve into the system above or vice versa. This cannot always be accomplished. Air leakage is a consistent issue when dealing with rotary valves in a pneumatic conveying system. It does not matter if the system is positive pressure or a negative pressure system (vacuum). This article will explain the root cause of air leakage, the effects of air leakage in each type of system, and options to reduce air leakage across the rotary valve. Air leakage will occur in every rotary valve. There are three main areas where air leakage will be present in a rotary valve. The first and most obvious place that air leakage will occur in a rotary valve is within the empty pockets as they return to the inlet. 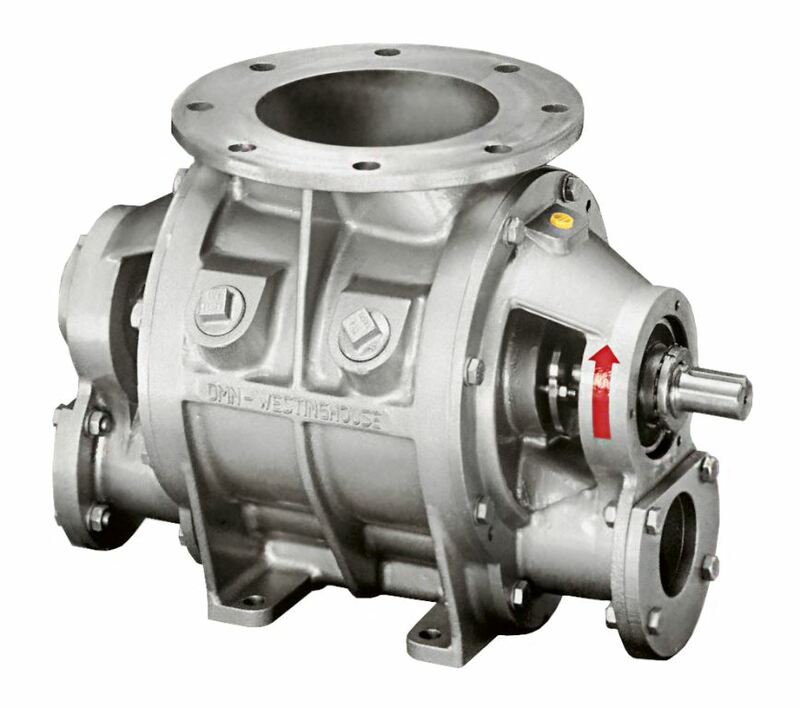 The second and third areas on a rotary valve where leakage can occur are the clearance between the housing and the rotor vanes. This can happen between the top sides of the vane (radially) or on the sides of the vanes between the end covers (axially). The rotor vane tip tolerances are very important to the valve function. We will discuss this further later in the article. Air leakage can happen in a positive pressure system or a vacuum system. In a positive pressure system, the air leaks across the valve and this loss of air cannot be used for conveying the product. Therefore, a larger blower package will be needed to move the dry material fed by the rotary valve into the conveying line. Also, the amount of air leaking across the valve can affect the efficiency at which the product throughput rate is discharged from the valve. Therefore, the sizing of the blower package becomes extremely important. 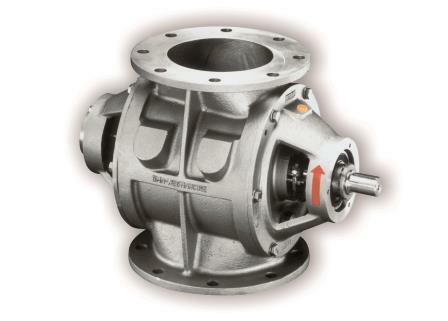 In order to ensure that the valve will be working efficiently and the blower package is sized correctly, you can ask your rotary valve manufacturer for an air leakage rate for the valve they are providing. Vacuum conveying or negative pressure systems are not immune to issues with air leakage as well. For example, if you have a vacuum receiver with a rotary airlock and the valve is discharging the product into a drum, there is a potential for air leakage from the ambient air on the discharge side of the valve. The air could go up through the rotary valve and enter the vacuum receiver. Once this happens, the vacuum can now pull too much air and enter the system. This will affect the product being pulled over by the vacuum and could cause problem for the entire system. Now that we have identified how the rotary valve can introduce air leakage into both a negative or positive pressure system, we will discuss the various things that can be done to a rotary valve to help limit this air leakage. First we will highlight what can be done to prevent the air from entering the system via the return pocket. Then we will discuss the rotor vane tolerances and the role they play. After the rotor pocket displaces the product into the conveying system, it begins its return to pick up more product at the inlet. But while the rotor pocket seems to be returning the inlet empty, it actually is not. The rotor pocket could have some air, especially, in a positive pressure system. And you need to discharge this air before the rotor pocket reaches the inlet. If this air leaks back into the vessel above the valve, it could severely affect the way the product discharges out of the vessel. The question becomes: how do you discharge the air? There are a couple of options to rid the rotor pocket of the air before it reaches the inlet of the rotary valve. The first option is you can request that the rotary valve come complete with vent ports. The vent ports are usually on the side of the housing of the rotary valve. You can orientate these vent ports any direction you choose. In a positive pressure system, the recommended orientation would be with the vent ports facing where the air is coming from and have the rotor rotating towards the vent ports. This is because you will then be able to discharge this pocket of air almost as soon as it enters the rotary valve. Once the air reaches the vent ports, you can have an adapter piece attached to these ports and release the air to atmosphere or reintroduce it into the system. The second option is called a vent box. This a round cylinder with a single vent port on the side. 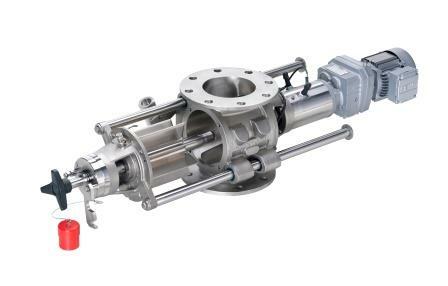 It has a connecting flange on either side so you can install the component between the rotary airlock and the vessel above the valve. The single vent port allows you to discharge the air that may be leaking out the inlet of the rotary valve before it enters the equipment above. The next way to limit air leakage is to make sure the valve has the tightest clearances possible between the rotor vanes and the valve housing and covers. These tolerances are generally based on temperature and pressure differentials. Therefore, it is important to make sure that you give your rotary valve manufacturer the correct maximum product temperatures and pressure differential. The best example where this would cause an issue with air leakage is if you gave your supplier a maximum temperature that was less than actual temperature. Typically, a rotary airlock manufacturer is going to leave more room for higher temperatures to allow for the rotor in the valve to grow because of thermo-dynamic properties in the metal. If the product temperature is actually less than originally thought, it could lend to your rotor clearances being larger and allowing air to leak across the valve. The rotor vanes may become worn over time. This will allow for air to pass across the valve as well. If you can accept bolt-on adjustable blades in your system, this is a great way to combat air leakage. This is because you can adjust the blade up, down, and side to side to get your rotor back in tolerance. Air leakage is inevitable when dealing with pneumatic conveying. Rotary airlocks are great components to assist you with limiting the amount of air leaking from one system to the other. As was pointed out, there are options that can help the user to further limit the air leakage. Air leakage can happen in any system whether it is a positive pressure or a negative pressure. 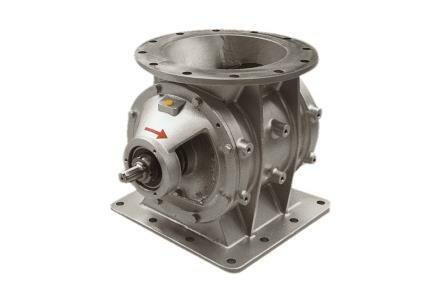 Just make sure you are getting the most efficient use of your rotary valve by exploring the use of vent ports, a vent box, or simply asking for an air leakage chart from the rotary valve supplier. Mike Wood is director of sales for North America at DMN Inc. He began his career at DMN as a business development representative eight years ago. For more information, visit www.dmnwestinghouse.com/us.